a + Collective will hold a series of activities around The Tanneries, beginning with a season of educational activities open to the public, offering shared tools for reflection and action within the context. The Tanneries are an important part of Vic's heritage, and their future depends upon citizen action, a commitment which the collective has assumed. The first lecture, by Montserrat Rocafiguera, professor, archaeologist and president of the Centre d'Investigacions Arqueològiques d'Osona (Center for Archaeological Research of Osona), will explain the patrimonial and archaeological value of The Tanneries of Vic. As she has stated in several interviews, learning about the historic legacy, learning about its cultural value, and taking measures of social responsibility helps us to understand, as a society, who we are and where we live. 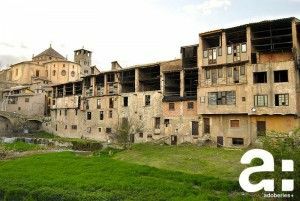 a + joins this initiative to continue the public debate about the past, present and future of the Tanneries. a+ is a collective created with the objective of revitalising the Tanneries district in Vic, based upon an awareness of the social, cultural, architectural and historic importance of this district. a+ aims to be a laboratory of ideas, an independent think tank open to public participation in generating proposals and activities which affect public space in this area, and which, at the same time, achieve prominence within the urban context. a+ collective was formed during the QUAM2015 from the "Public Interest, Collective Creation" workshop, organised along with Santiago Cirugeda- Recetas Urbanas. This workshop focused on the context of the Tanneries, from the perspective of urban recycling. The activity was promoted by ACVic in collaboration with the European Collaborative Arts Partnership Programme (CAPP). The initial group has been expanded in order to organise itself as a collective for reflection and positive action, aiming to influence the process of urban transformation. She has a graduate degree in history, specialising in Prehistory and Ancient History at the University of Barcelona, and has a Master's degree in Medieval Archaeology. Since 1988 she has co-directed excavations at the L’Esquerda site (Roda de Ter), being responsible for the Iberian area. She has also participated in the excavation of other sites, such as Casol de Puigcastellet at Folgueroles, Escorial (Vic), Sant Feliuet de Savassona, among others. Among her publications include Osona ibèrica, el territori dels antics ausetans (1995), published by Patronat d’Estudis Osonencs, and she has contributed to the following books: L’oppidum ibèric de l’Esquerda (1994), A banda i banda del Ter, Història de Roda (1995), El Casol de Puigcastellet, Folgueroles, Osona (1992) and L’Esquerda, 2500 anys d’història, 25 anys de recerca (2001), Desperta Ferro, catàleg dels metalls de l’Esquerda (2004), Archaeology, new approaches in Theory and Techniques (2012); Experiments Past (2014). She has also published several articles in both specialist and general-interest journals and conferences, as well as organising several guided visits to sites in the county and city. She is a lecturer at Vic's Col·legi Escorial, and since 1996 she has worked with UVic as a teacher and coordinator of the Archaeology, Excavation, and Experimental Archaeological course at the Summer University of UVic. She has been a member of the Patronat d’estudis osonencs (Board of archeology studies in Osona), has been the president of CIAO Centre d’Investigacions Arqueològiques d’Osona (Centre for Archaeological Research of Osona) since 2010, and has been part of the Patronat de la Ciutat Antiga de Vic (Board of the Old Town of Vic) since 2013.